Blue Susan makes: Giveaway Day!!! Hello everyone! Today is Giveaway Day! Not just here on our blog but on lots of others too. SewMamaSew is hosting this fun event where everyone with a shop or a blog can link up an item that they would like to giveaway. Which means there are A LOT of other things you can win around blogland. The giveaways are open for one full week so you can take your time browsing around and getting to know other fun blogs too. Want to see what we're giving away today?? The Mini Tulip tote PDF Pattern! This stylish little tote is the size of a small handbag. It is perfect for when you just want to carry the essentials. It has a wide base so it stands up by itself. The top opens up wide and stays closed snugly with 2 magnetic snaps. There are 2 pockets on the inside to organize your small items. It's quite roomy despite it's small size. The handles are sized to hang on your forearm, but you can lengthen them if you’d like. My favorite thing about the tulip tote is the ruching on the sides. I just love the texture it creates. This pattern features 18 pages of instructions with step by step photos, as well as 2 pattern sheets with printing instructions. Finished Dimensions are 7” tall X 14'' wide X 4'' deep with 16’’ handles. 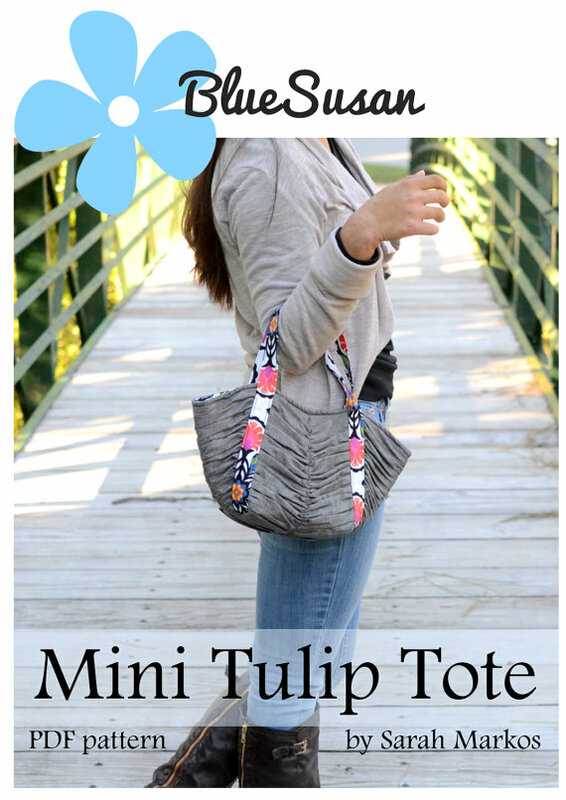 For more details about this pattern, check out my full Mini Tulip Tote post. Want to win the Pattern? Just leave a comment telling me your favorite thing to do with your free time. I'd love it if you'd follow me or "Like" me on Facebook too, but it's not required to enter. Make sure your email address is linked in your profile or leave it in the comment so I can find you. U.S. only. If you are new to Blue Susan Makes, Welcome to our little corner of the sewing world! You'll find me sewing handmade gifts, stuff for my kids and home, and lots of handbags. I'd love it if you'd check out my Blue Susan Etsy Shop and our sister shop, Beyond the Bead Jewelry. Let's keep in touch!. I love to quilt and play with my kids. I spend my free time sewing or playing with my grandkids, or sewing for my grandkids! I follow you on bloglovin. I love to sew and quilt. Try to spend time doing that each day. thanks for the cute giveaway. I spend my free time reading my favorite blogs,sewing and quilting. Your mini tulip bag is so cute. I spend my free time quilting when I can. Right now I am really trying to win a giveaway. You just keep on trying with your free time and who knows. Thank you for being a part of the Sew Mama Sew Giveaway Day and hoping you have a very Happy Holiday. I love sewing in my free time! If I have just a little time, quiet coffee is my favorite way to spend it. If the free time is longer, I either binge watch my current favorite show with my husband or take a walk. I like to watch Netflix and knit! I love to read, and trying new recipes too ! Hmmm my free time is scrolling Instagram, shopping online, some reading. I love to sew in my free time, of course! I also love reading and watching movies. I spend my free time sewing, knitting, reading and going to the beach. Happy to have found your site - the tote is adorable! I love to sew, read, bake and take pictures. I'm following you by email now. Many thanks! of course it's sew! And read, and truth be told, watch tv. Video games on the ipad. LeeAnna you are the winner! Thanks so much for entering and checking out our site!! I spend my free time, sewing, reading or knitting. Thanks for the chance to win. In my free time, I just love to read a good book without any interruptions. Not much free time. I sew if I have any free time. I love to sew in my free time -- but it's more of a "making time" thing! I love to sew in my free time.